No need to post two weights, I was the same each day. I ate pretty well…no sweets. A little extra cheese (which I had to get out of the refrigerator) and a lack of regular mealtime might not be my strong suits. My biggest priority is fixing my sweets habit, so I’m happy with the little change! 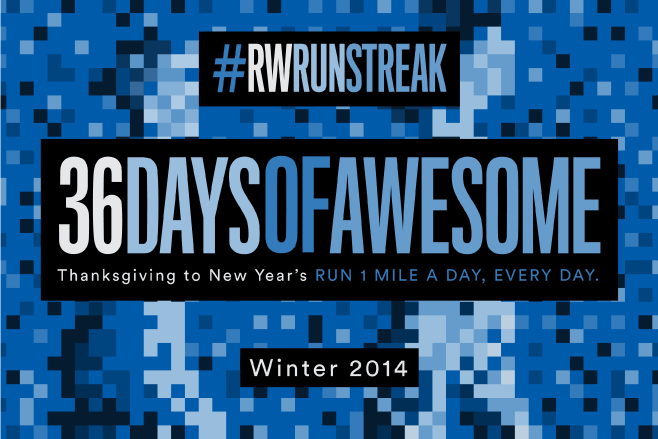 I’ve also joined the Runner’s World Running Streak challenge. The goal is to run (at least) a mile each day from Thanksgiving to the new year. I began yesterday, so got two miles in to make up for missing Friday. I’m not actually RUNNING the whole mile (yet), as I’ve been training on an interval since I started back running a few months ago. Just a month ago I was comfortable covering five miles. A bad-back for a couple of weeks left me doing little for exercise, and covering two miles feels crazily difficult. Sunday: Mile walk, Measured 1 @ 10:58, Measured 2 @ 10:52, Walk the rest, Total distance 6.8 miles @12:06 average pace. I must admit, I’m really, really sore today! My left hip is a little tight/pinchy, and my quads feel like I’ve run 20 miles. In as much as I’m not happy my legs are weak, the memory of running 20+ miles is a sweet one! Sweeter than any sugar I may be missing! Gallery | This entry was posted in The Decemberist, Uncategorized and tagged #rwrunstreak, Decemberist Diet, exercise, running, weight. Bookmark the permalink. Keep it up. These running steaks can be a blast.